In the early seventies Denmark was home to a wealth of progressive bands whose releases are now highly collectible and appreciated by music enthusiasts for their original Scandinavian sound. A little earlier in 1967 when rock music changed for good with the appearance of psychedelic rock and powerful blues trios like Cream and Jimi Hendrix Experience, it did not take long for Danish musicians to adopt the trio form and develop their own unique progressive sound. 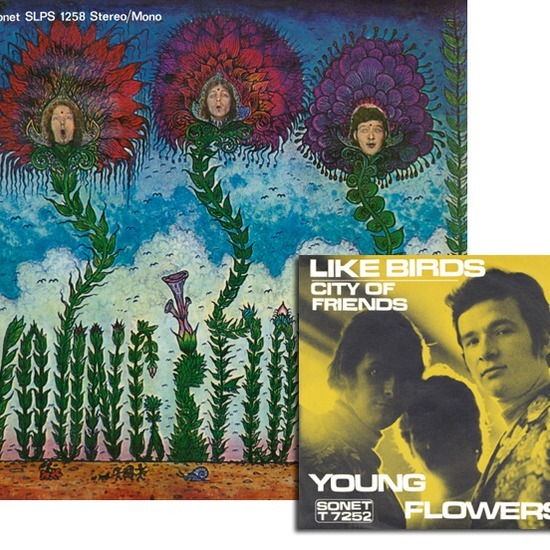 The most influential and long-lasting of these early Danish groups was the power-trio Young Flowers (1967-1970) from Copenhagen. They have recorded their single in 1967 and the first album “Blomsterpistolen” (flower-pistols) in 1968. Their second album “No.2” from 1969 will be also released on Shadoks later this year. “Blomsterpistolen” is perhaps the most important album from Denmark, full of fuzz guitar, great vocals and tight underground songs. It beats UK albums such as July, Open Mind and Andwellas Dream. For the first time an legit LP reissue.